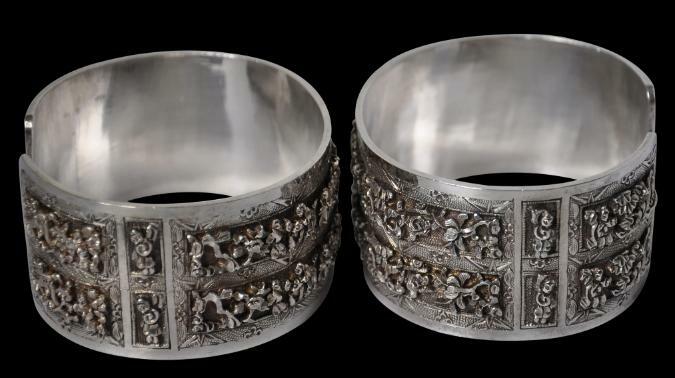 This pair of bracelets has been fashioned from high-grade silver. As such, they are noticeably heavy in the hand. Each is of ‘C’ form and the exteriors are decorated by a double band of applique work featuring densely-packed small images of immortals, including several astride horses, and other being as well as sprays of plum blossoms and other flowers, each of which has been carefully soldered on. 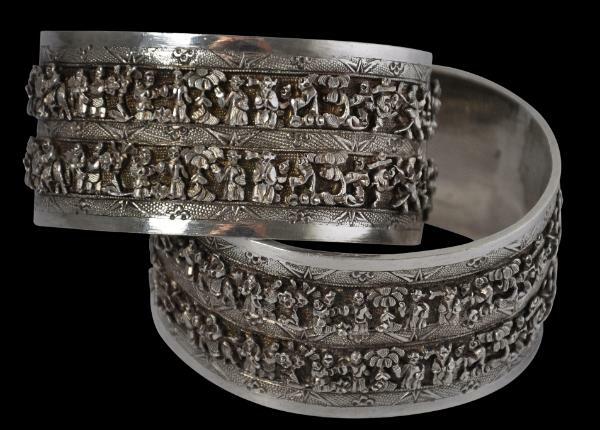 These bands are bordered by engraved bands of bamboo leaf and flower motifs against a ring-mat background. 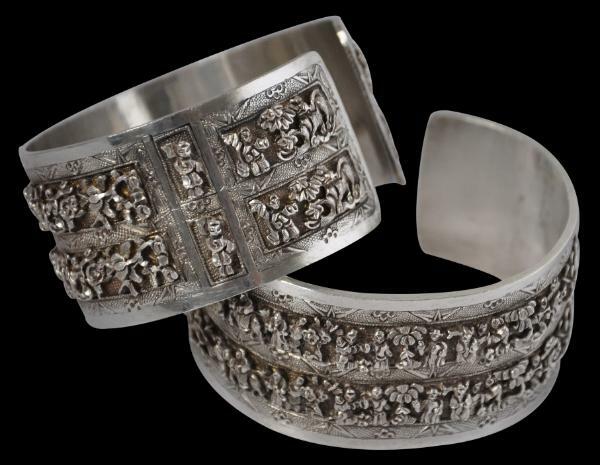 Both bracelets are stamped on their interiors with three sets of Chinese marks. One is for Yu Zhen, a maker based in Xiamen (Amoy) in China’s southern Fujian Province. Another is for ‘Xiamen’. 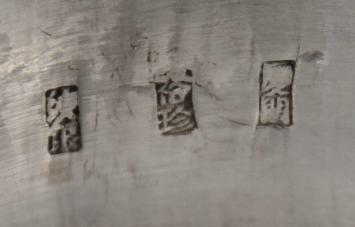 The final stamp is for ‘wen yin’ or ‘pure silver’. 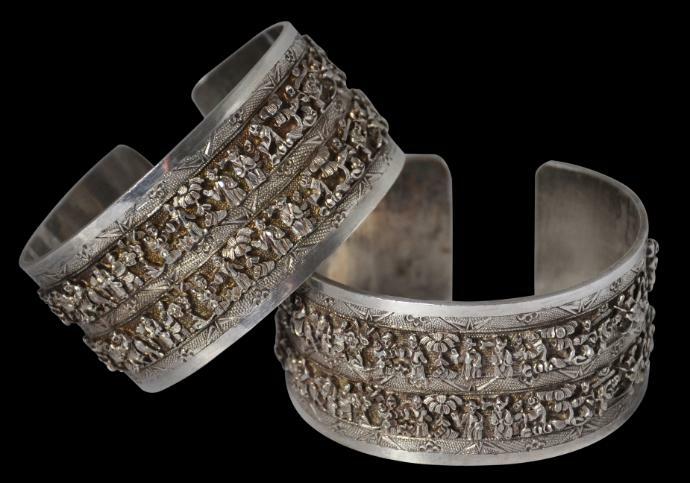 The bracelets are unusual in that they have a double row of applique figures. 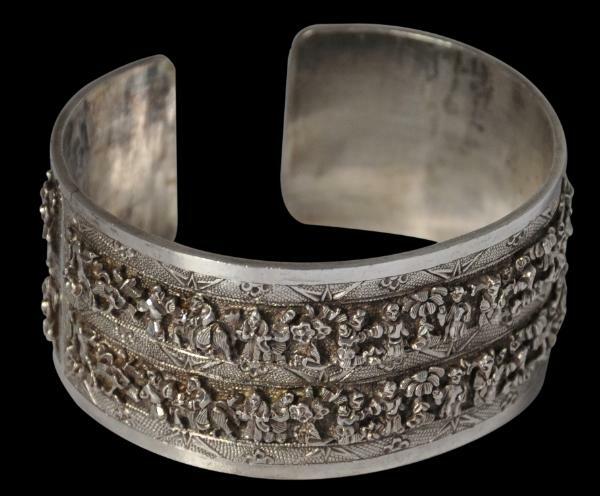 Most published examples of such bracelets feature just a single row. The double is significant – double bracelets – double good luck. He-He er xian (和合二仙), the two immortals He and He, who are the immortals associated with Harmony (和) and Union (合). These are two Daoist (Taoist) immortals popularly associated with happy marriage. Phoenix-like birds also are illustrated, which is also associated with marriage. Ho (1984, p. 128) illustrates a related ‘single row’ pair about which he observes were made in China, in Amoy. 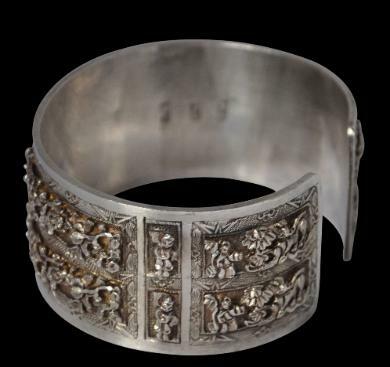 The bracelets were found in Malaysia, suggesting that such bracelets were made in China to be worn locally and possibly for export to Southeast Asia’s Chinese communities. 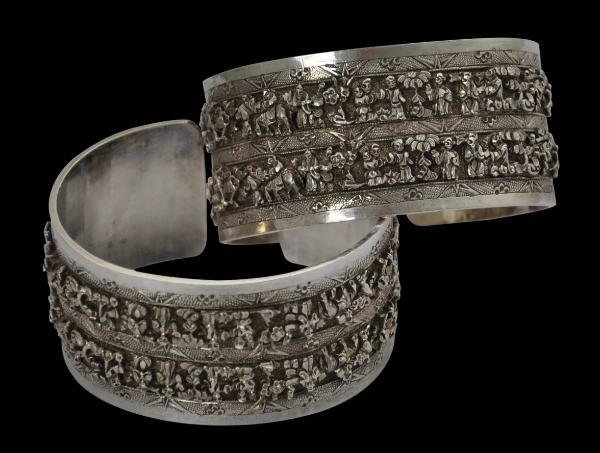 The scenes on both bracelets are identical. The features have remained sharp and clear, with little wear from polishing.